Yet my message here — for any lawyer or law student who wants to be a better legal writer, as well as legal writing professors — is that working on listening can contribute to stronger writing. The social aspect of legal writing means listening is crucial. Whenever an writing assignment or project is delegated through spoken words, listening sets the stage for successful writing. In professional contexts such as law practice, “successful writing” may be defined in large part as whether the writing satisfies the expectations of the person giving the assignment. Effectively listening to that person as he or she gives the assignment is therefore an important aspect of effectively writing it. Listen Like a Lawyer previously suggested a checklist for taking an assignment, itemizing the obvious points one needs to get out of such conversations as well as some of the more intuitive information to listen for. While listening at this stage doesn’t guarantee success, it’s hard to imagine how one could successfully complete the project without effectively listening first. On the other end of the process — but still fundamentally social — another link between good listening and good writing is handling feedback. Effectively listening to feedback and incorporating it into future work is crucial for a writer’s growth and development. The legal writing scholarship offers a number of insights into how professors should give feedback to 1Ls and what challenges they are likely to face. These recommendations help students listen to what their professors/writing mentors have to say. In law practice, however, attorneys most likely *are not* well trained to give writing feedback, either in writing or in person. Anyone ever receive back an entire page x-ed out and annotated with the lone word “awkward” or — my personal favorite — “revise”? While it’s pretty easy to see how listening contributes to the assignment and the feedback, what about the middle — the actual writing itself? This part of writing isn’t so social. There’s no one to listen to. Or maybe there is. Communications scholar Sara Lundsteen and others have suggested that part of good writing means having a good dialogue with oneself while creating. Being able to articulate what you’re writing about and why is part of a healthy writing process, writes Lundsteen in Listening: Its Impact at all Levels on Reading and Other Language Arts (1979). And being able to “hear” your own writing and revise it as needed are aspects of a healthy writing process as well. Here’s one amazing writer, Verlyn Klinkenborg, recommending that writers just listen to their own writing and notice how it sounds. In contrast, stressing out about how much the professor or supervising lawyer is going to hate this piece of writing is not an effective “voice” to listen to when trying to write. Models of writing such as Betty Flowers’ “madman-architect-carpenter-judge” (widely promoted among lawyers by Bryan Garner) help writers hold the critical voice at bay, opening their thoughts to more constructive internal dialogue. Methods such as Professor Mary Beth Beazley’s concept of “private memos” (footnotes with the writer’s questions and notes) help manage a writer’s internal dialogue as well. Preserving one’s personal voice while learning the conventions of legal writing is the concern of scholars such as Andrea McCardle. As the idea of internal dialogue demonstrates, “listening” is surprisingly difficult to define and inextricably intertwined with thinking. Here in the middle of the writing process, thinking as embodied and expressed in various ways — listening to your own internal voice, hearing the sound of your writing, reading your draft, speaking the words out loud, and writing some more — is what will make better writers and better writing. *For support and a more in-depth discussion, writing professors should check out Irene Lurkis Clark’s article on LIstening and Writing. I look forward to presenting about listening and writing at the upcoming 16th Biennial Conference of the Legal Writing Institute. Co-presenter Professor Tami Lefko will discuss listening, professionalism, and law school pedagogy. On the one hand, the writer is so familiar with his subject that he glosses over things the reader is utterly clueless about. On the other, it’s way too easy for the writer to get caught up in the minutiae of how things “really work” and lose sight of the story itself. This is something that, for some reason, lawyers seem particularly prone to. Composition scholars and legal writing scholars have been talking about this “curse of knowledge” in different words for a long time. In this post I’m drawing in particular on an article by Irene Lurkis Clark, Listening and Writing, 3 J. Basic Writing 81 (1981), available at http://wac.colostate.edu/jbw/v3n3/clark.pdf. Professor Lurkis Clark did some interesting work with listening and writing that helps explain why and how listening can help build better writing. Beginning legal writers face the double challenge of learning to use legal concepts and language with precision *and* writing about those concepts for a reader. The reader for our purposes is not just any reader, but a legal reader. Extensive legal writing scholarship explores these challenges and how to address them. A few key methods include reading excellent writing, following structured self-editing processes, reflecting on the writing process and written product, and obtaining/implementing meaningful feedback from peers, professors, supervising lawyers, and others. Effective listening can help with effective writing too. This is in part because language skills are integrated. Some scholars claim they are completely integrated (good reader = good writer = good listener = good speaker). Others take a more nuanced position, seeking to explore and define the boundaries between listening, reading, speaking, and writing. The extent of integration need not be resolved for listening to help a lawyer or law student wanting to write more effectively. For example, reading your work out loud is something we are all told to do. Professor Lurkis Clark explored the composition theory behind this recommendation — namely that “listenability” and “readability” are closely related. Early work in listenability actually used readability scores to measure listenability, a method that has been questioned and refined since then. Based on the connections between listenability and readability, Professor Lurkis Clark proposed that students listen to each other’s writing and share structured feedback. The idea is that beginning (non-legal) writers can build their reading comprehension skills and gain a stronger sense of audience. If students’ listening is stronger than their reading (which can be the case with unskilled writers), then critiques based on listening may be more advanced than those based on reading. One’s ability to listen . . . can enhance one’s ability to read, which, in turn, can enhance one’s ability to revise, which, finally, has significant implications for the production of coherent discourse. This post begins a series on listening and writing. Being a better listener can help with being a better writer. There are broad, non-law-specific reasons this is true, supported in the general communications literature. And there are law-specific reasons as well. Listening in childhood builds vocabulary and the ability to generate complex sentences. Problems with either type of listening could compromise the ability to generate strong writing. And strengths in these areas seem likely to correlate with strong writing. The application to legal writing is pretty obvious. If a (legal) writer has a strong vocabulary and ability to generate complex sentences, that person’s (legal) writing is likely to be more advanced. Likewise, if a (legal) writer is able to engage a meaningful internal dialogue about writing (“now I’m going to address the other element”), the writing is likely to be stronger. While reading helps with all of the above — of course — reading alone seems insufficient. Listening to words in context and using those words in conversation with others, listening to how words are arranged in spoken sentences, and listening to one’s own ideas about what is worth communicating and how to make that happen — all of these forms of listening can enrich one’s writing. Listen Like a Lawyer has been on hiatus during a busy time for first-year legal writing students and professors. 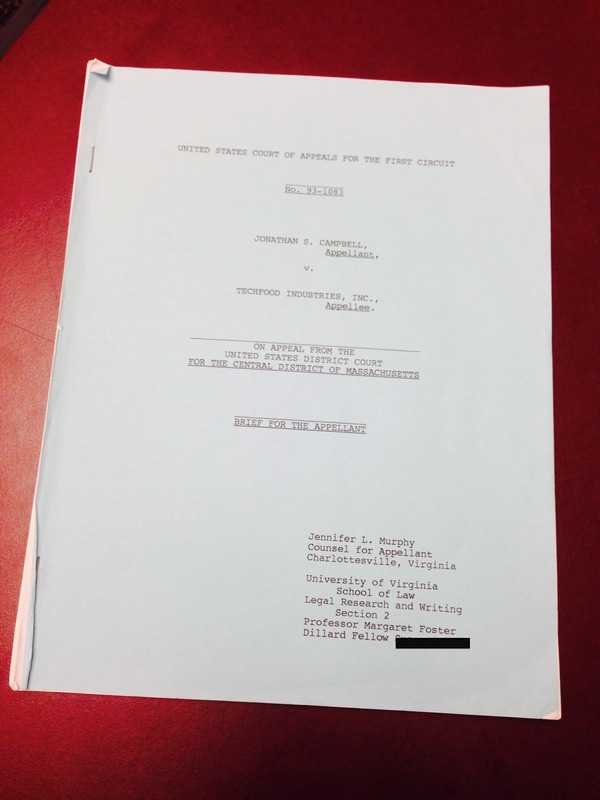 As the students wrote and finalized their first appellate briefs, I located my own old 1L appellate brief. Even without the 1996 date, the blue paper and Courier font are like a voice from the past. Maybe this “voice” should really be “voices”: I can hear the words of my professor in sentences that I never would have written on my own. For example: “The district court’s ruling can be comfortably affirmed under the first or third parts of the test.” What 1L comes up with the words “comfortably affirmed”? Also any use of the Code of Federal Regulations was purely a product of what she told the class to do. I had no idea what I was doing. And that leads to another voice: the voice of doubt. When in doubt, many people return to their comfort zone. For me, the comfort zone was description–basically, just summarizing the facts and holdings of cases. Several sequences of paragraphs consist of nothing more than “In one case, xyz happened. . . . In another case, abc happened . . . .” This brief was guilty of the incredibly common 1L mistake of the “book report,” as described by Kristen Tiscione in her article on classical rhetoric, Paradigm Lost: Recapturing Classical Rhetoric to Validate Legal Reasoning. Yes, those paragraphs should have had stronger topic sentences developing an actual legal standard. In “listening” to it now, I can hear the voice of a 1L who was just not sure what to say. Although there is much to criticize and pity in the brief, there are also moments of confidence. Good writing often corresponds with appealing rhythm and pace–features that one can hear when reading sentences out loud. In describing the client, who had been fired due to tobacco addiction and possibly his age as well, the brief juxtaposed his seniority against what the CEO wanted: “[The plaintiff’s] age and his advanced career actually hinder him; companies want ‘new blood that will stay forever.’ (R. 18).” The brief even reached for a figure of speech: “HIs tobacco addiction resulted in the Defendant’s firing him and the doors of the biotechnology market simultaneously shutting in his face throughout New England.” There is no doubt I stated these words — verbatim — at my 1L oral argument. Legal writing scholars debate the existence of “voice” in legal writing. As Chris Rideout has written, legal writing has a “professional voice” but not so much a “personal voice.” Legal writing professors walk the fine line of trying to teach the professional voice while not crushing the personal. Perhaps the voice of legal writing occupies a middle ground, as Rideout suggests: the voice comes from a “discoursal self” that performs a discourse tradition in its own way in that context, at that moment. The appellate brief, for example, embodies a certain tradition, yet the brief-writer has the opportunity to contribute to and even change the tradition in performing it. And my old brief was certainly a performance. The words reflect the very personal effort of a fledging grownup, trying on and testing out the professional voice of a lawyer. My actual voice as a 1L probably sounded a lot like it does now, because the human voice remains relatively stable from age 20 to 60. But my “voice” as a writer and a lawyer has developed so much since that 1L brief, with one of the most obvious improvements being stronger topic sentences. They could hardly have been worse. And experienced lawyers: maybe find a way to “listen” to the young lawyer and law student you used to be. Dig up some old work or find an old tape from a trial-advocacy class. Naive? Cynical? Confident? Scared? Yes, yes, yes, and yes. Sometimes it’s enlightening to listen to your own voice. The author dedicates this post to Stephanie Feldman-Aleong, a former colleague at Emory Law School and professor at Nova Southeastern, who passed away in 2008. Stephanie inspired me in many ways such as by sharing her own 1L work with students. Thanks to Beth Wilensky of the University of Michigan Law School for comments on an earlier draft of this post.